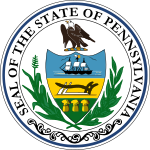 The Pennsylvania gubernatorial election of 1844 occurred on November 5, 1844. Incumbent Democratic governor David R. Porter was not a candidate for re-election. Democratic candidate Francis R. Shunk defeated Whig candidate Joseph Markle to become Governor of Pennsylvania.